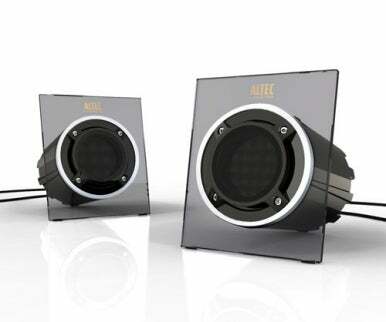 Altec Lansing’s Expressionist Classic, also known as the FX2020, is the least-expensive member of the company’s current “premium” line of computer speakers. In the case of the FX2020, the “premium” label applies more to the system’s design than to its audio quality. The FX2020 is a 2.0 speaker system, meaning it uses only left and right speakers. Compared to 2.1 systems—which consist of small, left and right satellites for higher frequencies, along with a larger speaker/amplifier component that sits under your desk and produces lower frequencies—a 2.0 system generally won’t be able to produce the same kind of bass punch. However, a 2.0 system doesn’t require you to find a place to stick a bulky subwoofer enclosure. What makes the FX2020 stand out is, as the Expressionist label implies, its design. Instead of a boring, utilitarian enclosure, the FX2020 has a unique look that, frankly, some people will love and others will hate. Each speaker driver is a 3-inch “full-range” model mounted in a 6.3-inch-long, black-plastic cylinder. The front of the cylinder is surrounded by a metallic ring and hosts a mesh screen mounted using four hex bolts. 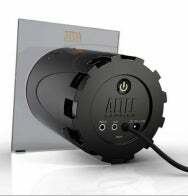 The rear of the cylinder sports a gear-like appearance that harkens back to Altec Lansing designs of old. But the most striking design element is a large, rectangular (5 inches wide by 6.3 inches high) plate, made of smoke plastic, that surrounds the front of each speaker. In addition to its aesthetic role, this plate acts as a stand that directs the speaker's output slightly upwards toward the listener. Thanks to the deep body and the large face, the FX2020 takes up quite a bit more room on your desk than you might expect; more, in fact, than the system’s larger and better-sounding sibling, the Expressionist Bass. The back of the right-hand speaker features a power button, the jack for the included AC adapter, and two stereo minijack inputs for connecting your computer and another audio source. The two inputs are mixed, allowing you to listen to your computer’s audio as well as, say, an iPod simultaneously; a single miniplug-to-miniplug cable is included. A permanently attached 6-foot cable connects the right and left speakers. While the FX2020’s design is notable, its sound quality doesn’t stand out. With such small drivers, you shouldn’t expect deep bass response; indeed, Altec Lansing rates the system down to only 100Hz, though in my testing bass response actually begins to roll off noticeably around 125Hz. But I also found the Classic’s treble response to be a bit lacking, resulting in a system where the midrange frequencies dominate. On the plus side, the FX2020 can reach louder volumes than I expected, given its power rating of just 7.5 Watts per channel, and the system provides considerably better sound quality than an iMac is capable of producing on its own. You won’t find a speaker system in this price range with such a distinct design; if you like that design, the price of the Expressionist Classic isn’t bad, and the system provides a solid upgrade over any Mac’s built-in speakers. However, if sound quality is your primary consideration, there are better-sounding speakers out there for the money.